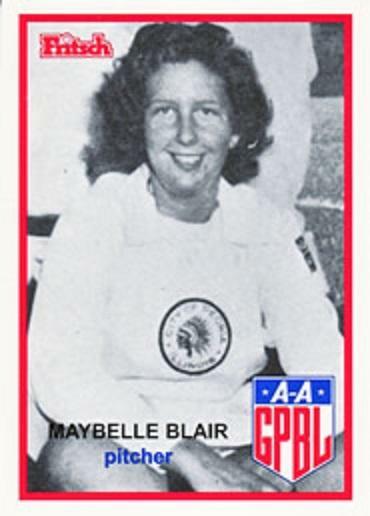 Maybelle Blair was already an accomplished softball player when she joined the Peoria Redwings of the AAGPBL for one season in 1948. She left the league the following year to play professional softball in Chicago. This Texas native then moved to California, where she attended Compton Junior College and then the LA School of Physiotherapy. After working at a treatment center in Los Angeles, she changed fields and began a 37-year career at Northrop Corporation. Maybelle started as a chauffeur and ended up as one of only three female managers at Northrop. After retirement, she became vice president of CELS, Central Extended Learning for Seniors, a program provider for Elderhostel. Maybelle co-chaired many AAGPBL-PA reunions in the Palm Springs area along with Shirley Burkovich, Maybelle also served on the Board of Directors and was Chair of the Fundraising Committee.